How Stean Gorge’s head of Outdoor Adventure and Education, Tony Liddy, has been awarded the Cave Instructor Certificate (CIC). 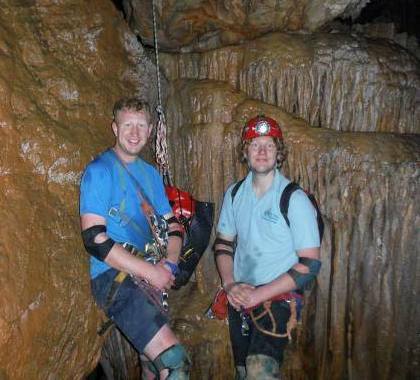 Only 84 people have been awarded the British Caving Association’s Certificate in the UK. Tony already has an outstanding portfolio of qualifications and experience in gorge walking, via ferrata, high ropes courses, rock climbing, canoeing and kayaking. Tony’s brother Dan, who instructs at How Stean as an associate instructor also achieved this award, which makes them the only two brothers to hold this high level certificate. Owner Stan Beer said: “We are very proud of Tony for achieving this rare national award. The Cave Instructor Certificate (CIC) Scheme is the highest instructing award designed for those involved in introducing others to caving, passing technical skills on to others and instructing in a variety of caves at different technical levels.